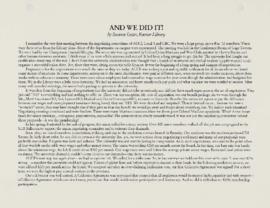 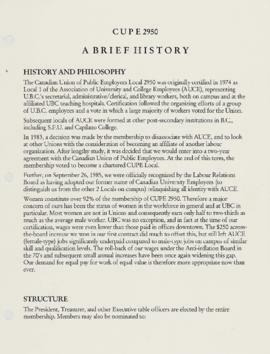 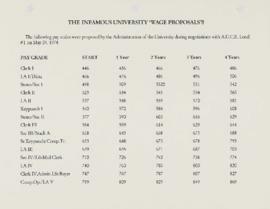 File contains materials relating to the formation of the Association of University and College Employees, including two issues of the AUCE Local 1 newsletter Across Campus, photocopies of articles, a report on the history of CUPE 2950 (AUCE successor), and an account of signing the first AUCE collective agreement, dated 1972 to 1999. 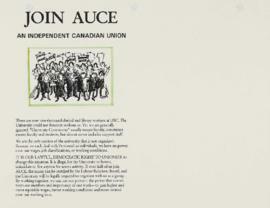 Across Campus Volume 2, Issue 5, April 1, 1974, urges members to vote for AUCE Local 1 (UBC) to represent library and clerical staff at UBC, and includes information on division meetings and stewards. 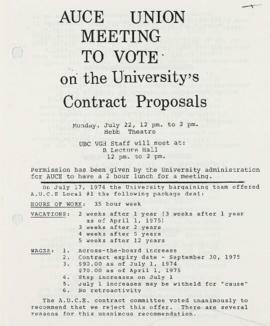 Across Campus Volume 2, Issue 8, June 4, 1974, describes a mass contract study session undertaken by 831 AUCE members, negotiations with UBC, a meeting notice, mediation strategies, powers of the executive, the grievance committee, provincial union representatives, notice of bylaw amendment, wage demands, AUCE members working at Vancouver General Hospital (VGH), statement of income and expenses for September 24, 1973 to May 15, 1974, UBC wage proposals, the treasurer's report including proposed expenditures for furniture and office equipment, and office staffing and duties. 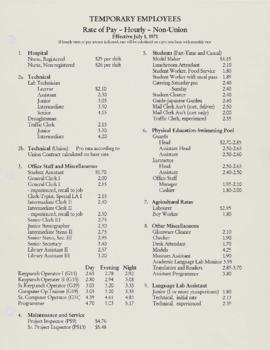 Other topics discussed include a comparision of employee rights and benefits from the 1970s to the 1990s, discussions about other unions (OTEU, CUPE), wages, organizing, membership, voting, contracts, negotiation, benefits, and the history of unions in Canada.